I didn't post last week, traveled to a special zoo with my granddaughters, a wonderful day! 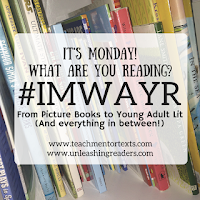 So, I've read many books since the last post, labeled them in groups so you can read what you're most interested in. This next “chiller” story from Mary Downing Hahn will be out mid-September, and it is filled with goose bumps for those who love them. Noted for a long time for writing this kind of book for pre-adolescents, Hahn has written another one that is both scary and sad, too. Daniel, a seventh grade boy, his little sister, Erica, seven, and his parents have moved to an old farm house outside of a forlorn town in West Virginia from an upscale neighborhood in Connecticut. His father has lost his job, they’ve had to give up their home and private schools, and are surviving the best way they can, by relocating. The house is in disrepair, and there are some creepy things going on from the first day. Daniel sees a shadow at the edge of the woods that first evening when they arrive, and the days and nights don’t improve. They’re the first family to live in the old Estes place since that family left fifty years ago. All the community, including the kids, knows why no one has lived there, but Daniel and his family don’t. And when they’re told of Auntie and her companion, they scoff at silly folk stories. Hahn layers on the bad times quickly, starts with someone watching them, and we read: “They’re ignorant fools, but they have something she wants, and she aims to get it.” Daniel tells this story of a family pulled apart in a house and community that does not welcome them. Hahn writes: “The past clung to them like a stain you couldn’t wash.” One must suspend one’s own beliefs when reading, and enjoy this roller-coaster ride into dark woods, a conjure or two, and a boy who won’t stop until he makes things good again. For those kids who enjoy reading scary tales, this one will suit them well. Thanks to Net Galley for the chance to read it early. I am grateful for the chance to read this astounding debut novel before it's published, thanks to Net Galley. Suzy, or Zu, as her mother calls her, is twelve, a seventh grader, who hasn't spoken since the early summer when she found out her used-to-be best friend Franny has died, drowned. The story is told by Zu in remembering the friendship with Franny, flashing to the present when chapters begin with the science teacher Mrs. Turton's instructions for the coming science project and presentation, alternating with some of Zu's science report about jellyfish. Zu becomes immersed in the possibility of Franny being stung by a deadly jellyfish, and all her thoughts and research focus there. I barely stopped reading this once begun, took a little while to get started, but thenI didn't stop until I finished. And now, I had to wait a while to find thoughts to write. I am reminded of the quote sent around quite a bit recently: "Be kind, for everyone you meet is fighting a hard battle." (John Watson) The central character, Trent, who tells the story certainly is. He's only twelve but when the story begins we learn that a hockey puck that he sent flying struck another boy, whose heart was weak, and killed him. That's just the beginning, and it is clear that Trent has a battle to fight, with family, friends, and a few enemies too. The wise young girl, Fallon Little, who befriends him, and the wise "old bat of a teacher' (Trent's words), Ms. Emerson, touch the heart as Trent works his way through this troubling sixth grade year. Lisa Graff has written a story that will help others, just as Absolutely Almost taught us life lessons, too. This wonderful, sad and happy, poignant, and heart-breaking comic/graphic novel moves back and forth at a rapid pace that had me questioning, re-reading, then looking carefully at dates at the beginnings of each part. Sunny, a sweet young blond with a "try-to" Dorothy Hamil wedge is seen waiting for her Grandpa in the airport, time to spend the summer with him. It's the seventies and she thinks it will be great fun; he lives in Florida. But wait, he lives in a retirement home, and all Sunny sees are old, old, old people. The first 'fun' thing they do is go to the post office, the outing of the day. And it seems to get worse, not better. Meanwhile, a next chapter goes back in time, and I began to see how the Holms would build the story, back and forth, slowly filling in what's been happening in Sunny's life and why she really is in Florida with Grandpa. She's learned well how to keep secrets and be "nice", especially when it involves someone she loves. Her brother is in trouble with drugs, Sunny finds out, but is forced to lie to hide it. No one tells her that her original summer plans are changed because the brother needs help. Also, her grandpa has bought a hide-a-bed and expects Sunny to say she's sleeping great. Luckily, she does make a friend, who introduces her to comics and super heroes, and she begins to work out that being honest is a good way to live. I hope this book lands with many young people who see Sunny's problems and discover that their problems connect. Then they might see that telling the truth can be important. The Holms have written a lovely story showing that having big struggles in a family is tough, but hiding them makes it even tougher. A young girl makes a teasing remark bout a boy who blushes, hence the "red", but others take her teasing to a mean level, until finally a bully gets rough. She does speak up first, scary as it is, and helps stop it, learns that others will back her, too. 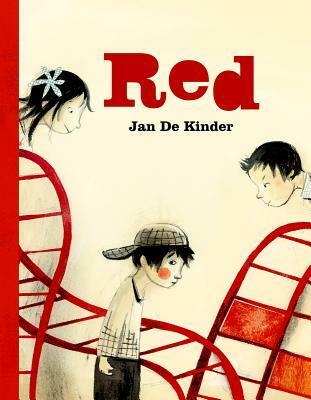 This book comes from Belgium, with what seems to be charcoal sketching, each page showing action on the playground, but especially wonderful expressions on the kids' faces. This will be a great book to start conversations about teasing, bullying, and being an ally. Sophia wants a giraffe, really. And finally she discovers that there is one right word in order to get one. Fun story, lots of interesting vocabulary lessons, really. 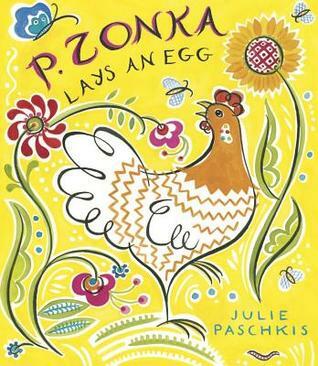 There are chickens who lay eggs every day, and some who only lay five per week, but P. Zonka, thus far, hasn't ever laid one. She travels around the chicken yard noticing beautiful things "day in and day out, staring at flowers and gawking at clouds." Other chickens around her pester her, constantly asking "why, why, doesn't she lay any eggs?" There is a fun surprise as P. Zonka finally answers. For those families who create "pysanky", this will be a treat to read around Easter time. The minute I started reading this, I knew I wanted to have it. then when I read it to my granddaughter, she said, "They're like the toys in my room. They like each other, and probably talk when I'm not around." It's the sweetest story straight from the imagination. Kevin Henkes uses beautifully subtle movement in the illustrations to show these creatures' actions. Look carefully! 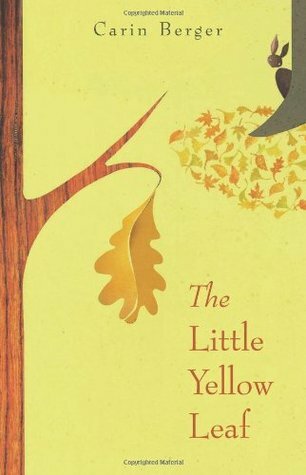 A story about the reluctance to do something daring, to let go, but also would be a good beginning book to talk about autumn. One yellow leaf hangs on, when all the other things are changing, the pumpkins growing and deepening in color, the apples ripening, trees are nearly bare. No matter what, the leaf continues to stay the same, on the branch, even in a snowstorm. Excitement grows page by page as we wonder what will happen, and finally this leaf spies another, a red leaf way up high. It's always easier to do something new with a friend. The collage art by Carin Berger is wonderful. It's a mentor text for art projects, too. Written in verse, the story takes us along as Anna shows the beautiful pieces she finds outdoors to keep on a table in her room, a shell, a bird's skull, a dried pomegranate. 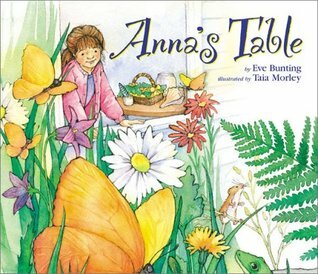 Colorful memories painted by Taia Morley and poetic words by Eve Bunting keep the story going as Anna celebrates all the things she loves and has collected. I enjoyed this because I too have things from nature in various places at home. And I am reminded of a story about William Faulkner who said that he kept a 'pretty table' where he displayed things he thought 'pretty'. This could be a nice book to start a table in a classroom for displays. 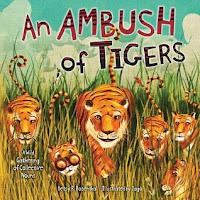 Delightfully rhyming, filled with realistic and then humorous illustrations to support the rhymes. "Can a parcel of penguins/be sent in the mail?/An intrusion of roaches/be thrown into jail?" The author does use the group names. Some are familiar to me (a murder of crows) and some are new (a walk of snails). For older readers. 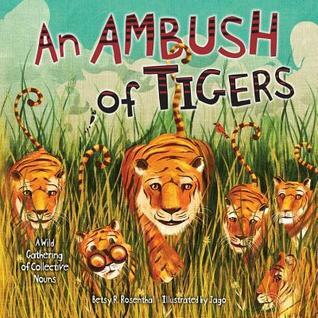 Some of the concepts are abstract enough that they may be difficult for the youngest readers. Just finished: The Bookseller of Kabul by Asne Seierstad. I'll review on Goodreads, definitely for high school and adult. Starting: A.S. King's new book, out this week, I Crawl Through It. Of course the jellyfish book is on the list for National Book Award. Sigh. I did like Lost in the Sun more than I thought I would. Do middle grade authors think preteens are obsessed with death or something? Or that there is value in hitting them with it in so many books out there? Again, giant sigh. I know what you mean about the death theme, Karen. These particular books, while wonderfully written, are hard to recommend to most students. It was much more fun to share a fantasy or a sci-fi story. Lots of great books! 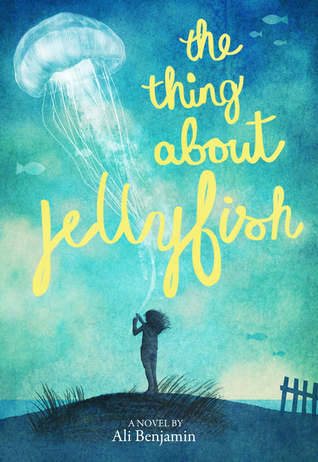 I loved Jellyfish - made me think a lot about the character after I closed the book. I really need to get to Lost in the Sun! And I loved the illustrations in Waiting. I've got to believe there will be a shiny sticker in the future for that book. Thanks, Michele, agree on all you wrote. Waiting is just sweet. If I was still teaching an older class I think I would read it to them too, & know they would have memories to share. Thanks for sharing all those picture books. 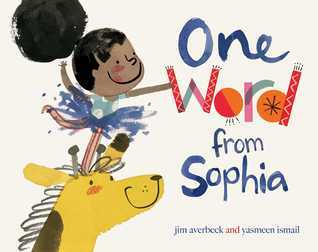 One Word from Sophia sounds sweet so I had to check it out on Amazon. I think I'll be reading it soon! You're welcome, Lisa. Hope you enjoy that very fun book! I read One Little Word and Sunny Side Up this past week. Loved both of them! Now I've got some new titles to add to my requests at the library. Thanks, Linda! You're welcome, Ramona. Enjoy what you find! I'd managed to resist purchasing Waiting until I read your review, but now I must have it, LOL. I do love P.Zonka--such a celebration of wonder and individuality. I've had Lost in the Sun as an ARC for nearly a year now and still haven't read it. Have been hoping to read aloud to my son, but the cover isn't very appealing to him. He loved Absolutely Almost, though, and think he'd be very interested in this story as well. I've got Sunny Side Up but haven't started it yet--saving it for a reading rut, as that's just the kind of book that snaps me out of one! Glad you had a good trip to the zoo with your granddaughters last week! Lost In The Sun captures a different theme than Absolutely Almost so I'm not sure he would enjoy it, Elisabeth. Sunny Side Up didn't take very long, FYI, but I did enjoy it & its purpose, too. Thanks for coming by. I did have a lovely adventure with the granddaughters! Here's another great list of titles that I haven't read yet! So many books, so little time, but I am looking forward to all of these. There are so, so many, I agree, Jane. Hope you find some that you love here. Jellyfish was an interesting read. I read it for Children's Institute and was glad to see it as a longlist titlefor the National Book Award. Oh, glad you liked it, Earl. All those long list titles must be good! So many great books!! 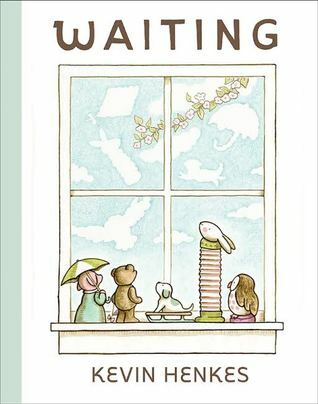 I love Waiting and One Word From Sophia - such lovely books. Thanks for sharing! I am usually surrounded by picture books, but I'm always looking for middle years recommendations, and these look like strong choices. I hope you'll find and enjoy them, Jane. I don't always read middle grade ones, but am happy to have read these. I want to read all of these! (except for P. Zonka which I HAVE read and thought was adorable and lovely). 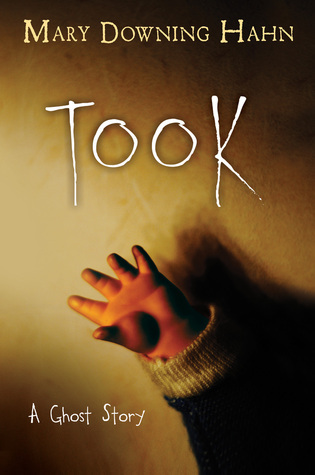 I'm especially excited for Took as I get kids asking for scary stories all the time. I bet they'd love Took, Hannhlily. It was fun, not too long, and the main character showed such bravery when he had to go alone to rescue his sister. P. Zonka was new to me, but I enjoyed it very much. Your reading list always amazes me. 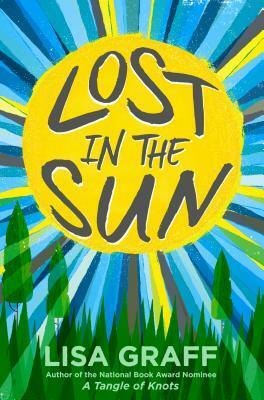 I read Lost in the Sun and was conflicted all the way through. There's no break. In the end, Trent softens, but I still feel he will struggle. No easy answers in real life. 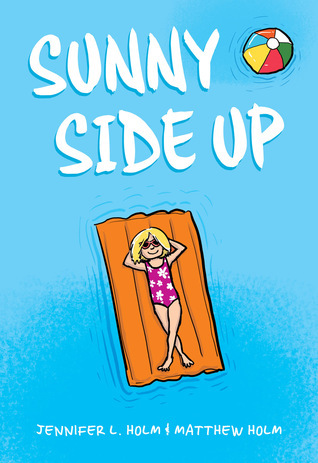 My students will grab up any graphic novel, so I was happy to add Sunny Side Up to the collection. They are passing it around. Yes, I agree about Lost In The Sun, and still wonder to whom I would recommend it. Sunny Side Up didn't take long, but I think a re-look at the pictures would be wise, too. There are some wonderful things tucked into the art. Thanks, Debbie. I love Julie Paschkis too, and have just gotten her new poetry book, Flutter & Hum, will review next time. I agree with you about Waiting. I must own that book. So glad you liked Sunny Side Up! It is a special book, and I hope my students really enjoy it. I love Henkes, so I need to get Waiting. I look forward to reading it. Glad you had fun with your granddaughter! Thank you Kellee, I will be interested to hear what students say about Sunny Side Up. Yes, Waiting is just lovely. I hadn't heard of the jellyfish book, and then all of a sudden, BAM! Everyone is talking about it. It is funny how a little publicity goes a long way! Thanks for sharing! It's that good, Ricki, and perhaps they got a lot of pre-readers too. I think the pub date was the 15th. Hope you'll get to read it sometime soon. Thanks! We just finished reading Sunny Side Up and absolutely loved it. What a powerful book for students who are trying to deal with some of the same issues Sunny is facing. Yes, I agree. And as said above, I hope I'll get to hear how students feel about it. Thanks for these reviews, Linda. Mary Downing Hahn was my daughter's favorite author when she was younger. I'm too chicken to read her scary stories. This one was pretty scary, but I know some students who would love it, Laura. 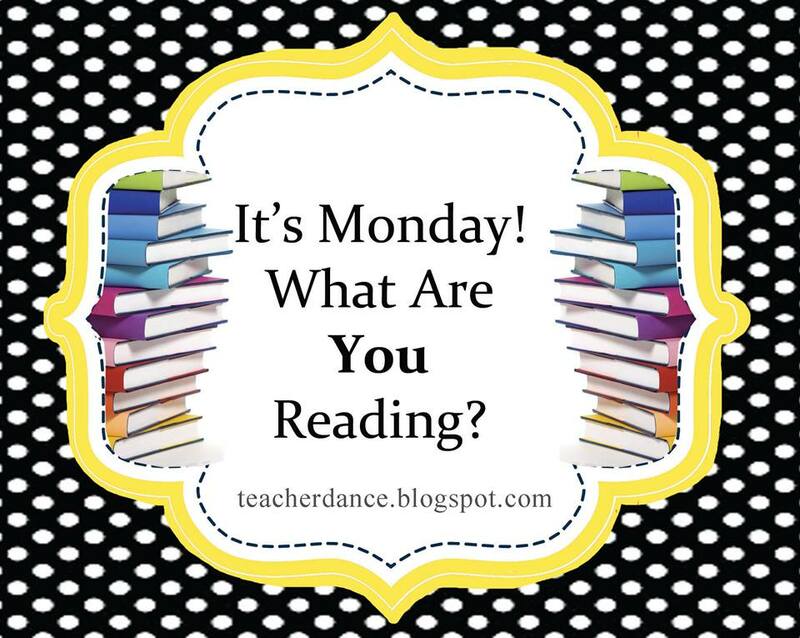 Hope you found a new book to read and enjoy. 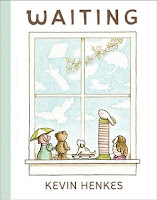 Waiting sounds like such a wonderful book!